Thanks, Angie, for such cute contest winnings. The sheepie is just the cutest stuffed toy I've seen in a while. The yarn is lovely and so soft. This place seems like a dream shop to me. Pottery lessons and yarn in the same place!!! I'm not good at either but I love to play with them both. Way back when, before I started my current traveling job career, I took pottery lessons on Wednesday nights. I have still have most of my chunky fired pottery.........that didn't blow up in the kiln, that is. Someday, I'm going to play with clay again. Delicious, squishy, wonderful clay. DH and I are about to embark (with the help of our general contractor) on the basement redo project as well as the tear-down and redo of our sunroom (aka room with a moat). It is very exciting but also full of crossing of fingers and toes that no weird things happen during construction, like, say, a geyser springing up in the yard. Heaven forbid. That would be just too much of a "design element" to work around, don't you think? At least, there should be blog material for a while. 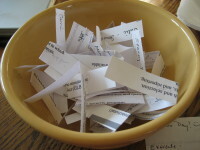 The randomly selected (DH, paper slips, and a tupperware) winners are: blogless Nicole, Julie, and Stacey! Congratulations and thank you everyone for your great suggestions. The redo of the studio is in the preliminary planning stages. That is code for we are waiting for the general contractor's bid and the check from the insurance company. I won't be able to avoid blogging about the basement re-do, so you will see, eventually, the final studio with all the suggestions taken to heart. My 300th post finds me in Rice Lake, Wisconsin, and thankful for high-speed Internet access. All of Wisconsin is lovely and this area is no exception. It is so green here and the traffic is certainly much lighter than around the southern part of the state. So, even for a Monday after a week of vacation, I feel pretty good. Thanks to everyone who reads this weblog and to all of you that comment. I've been blogging for about one and a half years and it has really enriched my life. I've found wonderful new friends through blogging and I've even gotten closer to members of my family that read the blog. Thanks for enriching my life, you guys. Look what my twin, the Marvelously Evil Stacey, sent me! She's so creative. I love the stitch markers! They are very cool (or should I say hot?) and quite seasonal with the "bite me!" and the SOS08 markers. Here's the whole package with the very clever handmade card and hollyhock seeds. Thank you, Stacey! I know exactly where I'm going to start a few this week. It was a lovely day on Monday. We had very low humidity, blue skies, and temperatures right around 80 degrees (F). I made a bunch of calls and emails for the basement-related reconstruction, read through the great studio re-organization contest entries, and then ran errands and did some shopping in Madison in the afternoon. When I returned home, I wandered around the yard, camera in hand, primarily to properly blog my Stacey-gift. The cats were following me and DH as we discussed the chain-sawing of several large trees that fell in the recent storms. Blue and White Dot were wrestling, as they do regularly, and I was able to capture the fun with the video feature on the little camera. Watch for the hanks of fur on White Dot's paws. Fuzzle enters into the video near the end to check out what the boys were up to. Catching up, organizing, and a contest! This morning's sock status report: The fixation footies came with me to Chicago and are a little bit bigger. I picked up the gusset stitches this morning because the train didn't have the lighting I needed with my eyes and this part-black yarn. I picked up those stitches even before my morning caffeine. Crazy. I know the footies are not SOS08 material but I just wanted to finish them. I am l looking forward to returning to the Magic FG socks that DO qualify for SOS. I'll be using Cookie's Short-Row tutorial for the Magic FG sock heels. Thanks, Cookie. Weave!! I've had the rigid heddle loom set-up (not warped, Stacey,) for the longest time and now I can get the first project going. Try to get a few buttons on the blog and generally spruce it up. and if time presents itself, sew and dye some yarn. I have an opportunity to redo the area that I call my studio because of the recent basement event (ahem). I would like you to comment with ideas for me to consider for the new and improved space. I would like to read about how you organize your stash or craft area. Comment with ideas you've found that you think are cool or interesting for organizing or decorating the place that you have designated for knitting, weaving, needlecrafts, and/or other creative endeavors. Book and website references are very welcome, too. Even if you don't have an idea, comment to be included in the contest. Comment on this post or any more recent posts with an idea for me until Sunday, July 6th at midnight. You can submit any number of ideas or just plain comments for the contest, each a separate comment. I'll count up to three entries per person. One prize per person. I'll choose three winners randomly from the comments. Thanks in advance for all your ideas. I'm looking forward to reading them. ETA: You don't need an idea to comment for the contest! The oregano in my herb garden has just loved this weather. It was waving around, hogging garden space from the rosemary and the chives and the greek oregano. So, on Sunday, I hacked off about half the plant. I harvested a big batch......a fills the sink kind of batch. Since we are still drying things out in the house, I thought the front porch might be a more successful place to dry. At least they will look "scenic" for a few days.... I have a dehydrator that I usually dry herbs in but this batch would have required ten of them. Wisconsin isn't exactly the high desert of California, so it is quite likely that this outside drying of herbs thing may be an experiment gone wrong, but it kept me busy while waiting for our insurance adjuster to make his way to us through the flooded highway infrastructure that is Columbia County. I found Sunday that I have developed a pacing habit and it isn't something I'm happy about. I did knit but I kept dropping the yarn. More yoga for me, I see. That or see if I can find my cute red GoKnit pouch from Scout that hangs on my belt loop in the debris of my studio. It was an educational visit. The news from the adjuster is looking better than initially thought but it isn't final. The relatively little bit of water and icky-stuff combination did a whole lot of damage to a finished basement. Today, the clean up guys were here again to remove not-so-sanitary paneling (that, frankly, I won't miss too much), insulation, drywall, and woodwork. They worked hard ---- until 8:30 pm (!) and they will be back tomorrow morning at 7 am (gasp!) for a few more hours of work. The cats are confined to the bedroom due to all the drywall dust, nails, and debris that they would be bound to venture through if they were roaming the house. The honeysuckle is getting a lot of blog time but I do love it. I'm going to be approaching the 300 post milestone soon so watch for a contest announcement soon. Thank you to everyone who participated in the birthday comment contest! This morning the entrants were formally processed and the random selection pool device was prepared. DH, being an impartial being, removed his glasses and made the random selections of two entrants. 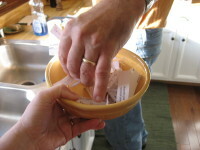 His hand looks almost too large for the random selection pool device but he pulled two names out of the hat bowl pool device. Congratulations to Kathy W. and to Angie (not me, the *other* Angie.)! I've sent you both emails and if you will respond with a snail mail address, your yarny prize(s) will be on the way to you soonly. Another suggestion was to not engage in a desired activity, like knitting, until I had completed my daily 30 minutes or whatever of exercise. Another commenter said she ran two miles every couple of days. She didn't like it but rewarded herself with craft activities after her run. One commenter said she included exercise in the things she did in the morning like showering and dressing to make sure exercise got included each day. One commenter included exercise in her day through dance since she enjoyed dancing. One commenter also made a big impression on me for ways to exercise when she suggested Denise Austin or Kathy Smith pilates dvds. She said she got rid of her four-baby tummy in a year and these exercises were of the low-sweat variety. Another comment was to have an exercise buddy, someone that depended on me to exercise with. That way, the guilt of potentially letting someone down would motivate me to continue to exercise. Guilt in that context is good. These are all great suggestions and I think they will add to my methods and motivation to include *e* more often in my daily routine. Of course, there is no "switch" to flip and presto I'm fit, but I'll try to blog more about my efforts and maybe you all will be my virtual exercise buddies. How about that? I spent time in the garden both Saturday and Sunday --- tearing out the frosted tomato and pepper plants, putting away the tomato cages, and digging the carrots. The carrots were a cool and generally successful experiment but I don't think I'll plant them again next year. DH is not really fond of carrots. I'll probably make a carrot cake for my birthday then share the rest of the carrots with my Mom. You know, one of the best things about carrot cake is the cream cheese frosting! Yum! I also did a bit of trimming and cleaning in the herb garden. If anyone needs/wants any lamb's ear next year just let me know. Mine spawned numerous little babies that I'll be transplanting or thinning next Spring. I think lamb's ear is an appropriate plant for a knitter or spinner! Don't you think so, too? Yes, I'm on the road again. (Willie Nelson, anyone?) 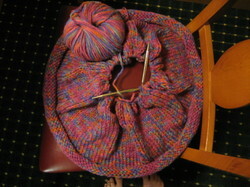 I'm going to see if I can strike a balance between blogs and knitting. No, I'm not taking any bets.